No, the Earth is not headed for 15 days of darkness on Nov. 15, 2015. This hoax was spawned by a fake news site. 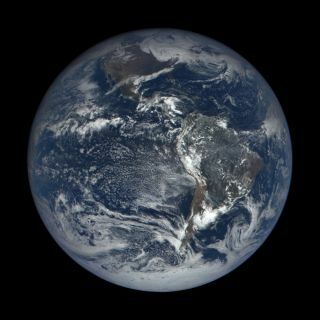 Shown here: the fully lit Earth as seen by NASA's Deep Space Climate Observatory. Abraham Lincoln did not have social media in his time. If he did, I honestly believe he might have reconsidered his final observation that "you cannot fool all the people all the time." There have been a few stories in recent years that have made their way through cyberspace that have been pretty much off the wall … so much so, you would think that very few, if any, people would be fooled. But in reality, a surprisingly large number of people took them at face value, believing they were true. The most famous, of course, is the annual "Mars Hoax," which rears its ugly head every August. Ever since a historically close approach of the Red Planet to Earth occurred in August 2003, a spurious Internet story has circulated every year since, which implies that on a specific night in late August, Mars will loom in the sky as the same size as the full moon. Totally untrue, of course, yet every year there are countless people who actually believe it will happen. Then earlier this year, a widely shared story on the Web claimed that Jan. 4 was "Zero Gravity Day," a date when people on Earth would supposedly be able to experienceweightlessness if they jumped into the air at a specific moment that day. One has to wonder just how many people worldwide actually tried to float on that day. Of course, like the Mars story and Zero Gravity Day, this supposed worldwide blackout is false. And yet, the Internet is crackling with all sorts of reports on what to expect. A fake news site — "Newswatch 33" — is apparently the reference source for this bogus report. The Earth, the report says, will go dark Nov. 15, just before 3 a.m. (no clue if this is Eastern, Central, Mountain, Pacific Standard or any other time). Then, after 15 days, the eerie darkness will finally lift on Nov. 30, at 4:45 p.m.
President Barack Obama purportedly has been briefed about the upcoming phenomenon in a 1,000-page memorandum from NASA Administrator Charles Bolden. The reason given for the blackout? The recent close conjunction of Venus and Jupiterin the predawn morning sky of Oct. 26. Venus, always the brightest planet, came so close to Jupiter as seen from here on Earth that its dazzling light heated the Jovian atmosphere. Jupiter's reaction to Venus' "close approach" was to supposedly release a huge amount of hydrogen into its atmosphere, which in turn was apparently ejected into space and Sunday will induce a massive explosion on the sun. Wait … it gets better. The story continues to claim that the sun will then react to the outburst by attempting to cool itself down and in the process, will then turn blue as a result. And that's when everything on this planet of ours is supposed to go dark. The apocryphal details go on to claim that Bolden doesn't think the Earth will experience any major issues during the blackout: "This event will be similar to what Alaskans experience in the winter," Bolden supposedly says. "The only other effect it will have is everyone will get to have a true Black Friday after Thanksgiving." There's even a hashtag — #NovemberBlackOut — where people can tweet what they are going to do during the days of darkness. All of this is complete and utter nonsense, of course! The sun will continue shining through Thanksgiving, just as it does every year. Moreover, the "15 days of darkness" hoax was has been circulated a few times before, most recently this past June. Bottom line: Planet Earth will not go dark on Sunday … or at any time in the near (or distant) future. Any email or social media claims to the contrary are completely bogus. Don’t keep your family and friends "in the dark" (pun firmly intended) and spread the word.